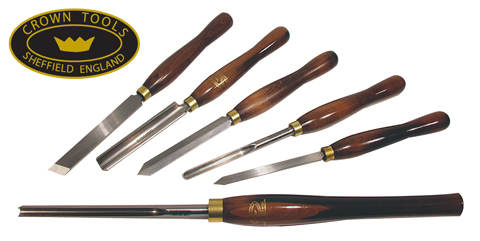 Made in Sheffield England, Crown Tools offer a good value. The general line is made of M2 high speed steel and are hardened to between 61 & 63 HRC for long edge life. All the Crown Tools have an 8-1/2" or 14" stained Beech Handle that are fitted with a solid brass ferrule. Tool length on the spindle tools is approx. 7" while tool length on the bowl gouges 10". All of the skews and scrapers measure 1/4" thick. Spindle Gouges are measured by their diameter while the Bowl Gouge diameters are 1/8" larger than the size listed.